The UNESCO cultural and scientific organization is to close its Moscow office in September 2015. The decision was made in 2008 and is related principally to financing issues, according to the head of Russia's permanent delegation to the organization. 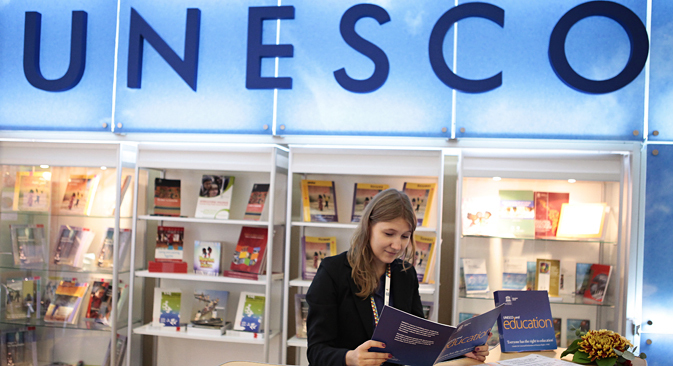 The scientific, educational and cultural organization UNESCO is to close its Moscow branch next year, according to Eleonora Mitrofanova, head of Russia's Permanent Delegation to the agency. "This is a planned closure," Mitrofanova explained to the ITAR-TASS news agency. "The decision was made in 2008, but something was always postponed. As is known, UNESCO is currently in a difficult financial situation. It is constantly looking for new funds." According to Mitrofanova, the decision to close UNESCO's Moscow office is part of a series of optimization measures designed for the organization's foreign branches. "This issue is always on the agenda, something is always opening or closing somewhere," she added. "But in this case we are dealing exclusively with financial reasons." The organization began having difficulties several years ago when the U.S. and then Israel stopped paying their contribution. The two countries refused financial assistance to UNESCO because it had included Palestine as a full-fledged member. As a result the budget of the international organization was reduced by 22 percent. This is not the first time UNESCO (United Nations Educational, Scientific and Cultural Organization) has been starved of finances by the U.S. In 1984, Washington cut its financing when President Ronald Reagan decided to quit the organization, accusing it of anti-Americanism, wastefulness and abandoning the objectives written in its charter. Eighteen years later, in September 2002, the U.S. announced that it was rejoining the body, though it did not formally return to the UNESCO fold until one year later, on Sept. 29, 2003. The Russian Foreign Ministry told RBTH that the situation was due exclusively to economic factors. Russian Deputy Foreign Minister Gennady Gatilov earlier echoed Eleonora Mitrofanova’s claim that the closure was part of "a planned process" in comments to the Interfax news agency. "There are absolutely no political reasons for this, no sensations in our relations, and no cessation of cooperation," said Gatilov. "Our relations with UNESCO are evolving successfully. Gatilov added that as of today the Moscow bureau has carried out all its objectives, though as a so-called “cluster bureau” whose activity also concerned other CIS countries, the scope of its activities became limited after Ukraine and Georgia left the bureau. Gatilov explained that Russia has created a commission for UNESCO's affairs, which includes committees for the main areas in the international organization's activities, and has also opened departments in a number of Russian regions. The commission will carry out UNESCO's functions independently. Natalya Dushkina, a professor at the Moscow Architectural Institute and a specialist in historic preservation, believes that the closing of UNESCO may have a negative impact on the preservation of monuments and research activity. "This was a big subdivision of the Paris UNESCO [office] with a large staff of specialists," said Dushkina. "The office was big, it carried out scientific work and supported educational programs. Now this field will have fewer specialists and less opportunity to receive qualified assistance and information. And since the number of world heritage sites on Russian territory is increasing, these people are essential." Dushkina notes that some of the sites protected by UNESCO in Russia are very complex. "For example, St. Petersburg is the largest urban planning project in the global pantheon," she said. "Then there are the unique wooden monuments in the Kizhi Museum Reserve in Russia's northwest. “I only hope this decision is temporary,” she added. “When the UNESCO office opened in Moscow it was an important event. It coordinated all the educational and research programs in the former Soviet republics." Sergei Orzhonikidze, president of the Russian Public Council on International Cooperation and Public Diplomacy at the Russian Civic Chamber, also sees the move to close the UNESCO office in Russia as a mistake, arguing that it is necessary to protect and study the country's cultural heritage. "It would have been better, if the bureau had only reduced its staff," said Orzhonikidze. This year the UNESCO office in Moscow for Azerbaijan, Armenia, Belarus, Moldova and Russia celebrated its 20th year of activity.